After taking his third podium finish of the year in Bahrain, our Iceman looks forward to racing closer to home with the start of the European season. Q: Yourself and the team currently occupy P2 in both the Drivers’ and Constructors’ Championships; are you pleased with how things are going? KR: For sure it’s an okay start and we’re in a better position that this time last year, but there’s a long season ahead and it’s too early to say if we can fight for the Championships right to the end. It’s going to be hard to catch Sebastian [Vettel] if he keeps taking good results so we need to start taking more points from him, but you never know what can happen. We’ll keep pushing to improve the car and see where we end up. Q: What’s required to bridge that gap to P1? KR: Some more wins! To catch the leaders, we have to work twice as hard as they are. It’s no secret that we want more speed from the car in qualifying; it’s so tight up there at the front and we really need to be on the first two rows to fight for victories every time. It’s good to be able to start the European season where we are as this is when you see teams starting to push on with lots of new parts for the cars. It’s still early days, but to have scored strong points since the start of the year is obviously better than not having them. We need to keep scoring points in the same way; even if it’s a bad weekend for us, we need to keep finishing as well as we can. That’s how we will fight to the end of the season. Q: How is the Circuit of Catalunya for you? KR: I have won twice in Barcelona and I was on the podium there last year too, so I really look forward to going there again; hopefully to end the weekend with another good result. It’s a circuit where you have to get everything exactly right to be at the top. All the teams have tested many times at this circuit, so to get an advantage there is not very easy. The set-up is crucial as the track changes with the wind and temperature so there’s plenty of work for the engineers too. Q: Is it good to be racing in Europe again? KR: I really like racing in Europe. We don’t have to travel that far so all your energy is saved for the weekend itself. Traditionally the real season starts when coming back to Europe. For me, it’s great. Q: The Circuit de Catalunya is the only circuit at which you’ve tested the E21 so far; does that help matters? KR: That’s true, but you have to remember that was at the end of February and the beginning of March so conditions were very different compared to what we hope to see in May. It was very difficult to get the tyres working properly when we were last there, but it was the same for everybody. We all start from zero again in FP1. Q: The team didn’t get so much mileage at Barcelona during testing, but reliability doesn’t seem to be so much of a concern now the season is underway? Q: You were quite reserved after the podium finish in Bahrain; were you happy with the result? KR: You’re never really happy if you don’t win, but I suppose second place is as close as you can get. We could maybe have been a few places higher in in qualifying which would have made things easier, but I drove to the maximum and luckily we found the pace in the car that was missing in qualifying. Let’s hope I’m happier in Spain. You could be forgiven for thinking that Kimi Raikkonen’s talk about needing to stop Sebastian Vettel’s charge already may sound a bit defeatist for a man just 10 points adrift of the top of the standings. But a quick look back at the title standings last year shows that Raikkonen has good reason to understand the need to not let his German rival edge clear. After the 2012 Spanish Grand Prix, Raikkonen was just 11 points behind Vettel in the standings, a gap that he never really got back under control again. With an intense development race on the horizon, and little separating the frontrunners in pace terms, every point from now on is going to count. And while there is only a seven points difference between winning and second, in championship terms a victory or defeat can turn into a ’14 pointer’ if they are against your main rival – and titles are often won by much less than that. I dont believe Kimi – or anyone else – can catch Seb Vettel or Red Bull in these early races of the season. RB have tons of cash and a certain Adrian Newey, so development is furious and ongoing. And even when Lotus is able make some gains – such as tyre management – Red Bull simply up the pace. But they will get that right as well. At this stage, even with 3 stops, as opposed to Lotus’ 2 stop strategy, RB are still able to catch, pass and then win. 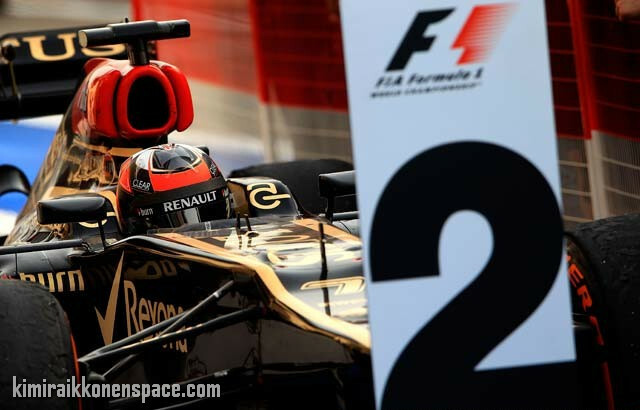 Bottom line: Lotus must up the pace, otherwise we watching are in for another season that will resemble 2012.